These stylish photo frames have been crafted from brushed metal and etched with encouraging Scripture texts. 22cm x 17cm. 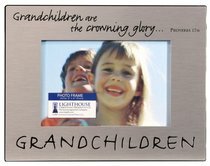 About "Pewter Photo Frame: Grandchildren"